I found the Nissan party easily at Katsuya, at LA Live. Some sprinkles but no real rain yet, and not so cold that I regretted not stopping at the car for my jacket. But a quick walk around the private party area confirmed the shy person’s nightmare: no one that I knew. I saw a lone Asian man sitting by himself, so I joined him, hoping he was a Nissan employee who I could make contact with for future car review opportunities. But while he was from Japan, he was merely another freelancer. No problem – we spent the next hour chatting away, which made it easier to relax and enjoy the excellent food. I also enjoyed an excellent hot sake, which arrived in a larger carafe than I expected. So after about an hour, we said our goodbyes and I made my way to the Figueroa Hotel for the Hyundai party, where I was greeted by a man and woman on stilts. The party is in the pool area, which has a plexiglass overlay allowing people to seemingly walk on water. We were promised surprise entertainment; the people on stilts lead me to believe we’ll be seeing some performers from Cirque du Soleil. But you know something? I am tired and want to go home. And am not looking forward to another drive down here tomorrow for day #2 of the Auto Show. So I will sit here and accept the tray passed hors d’ouvres until I feel it’s safe to drive home. Subaru was my last press conference of the day. There were others following it (Audi comes to mind), but luxury cars were not part of my assignment this year, and as much as I love me an A6, I have had a splitting headache for most of the day. I was also just plain tired. I am supposed to attend a reception the Nissan folks are giving, and have half a mind to be a no-show. But I kind of like the idea of waiting a while for traffic to die down. So I am still here. I ended up wandering up to the media room, and since it is no longer lunchtime (with no free food buffet), there are now plenty of places to sit. I finagled some Tylenol from the staff’s first aid kit, grabbed some hot decaf and enjoyed the wi-fi (none on the auto show floor, just in these media spaces). Am happy that I caught up with my friend Sarah before she left. A number of local bloggy moms were invited to the show as guests of Toyota, so I saw their tweets – but we were all in different areas of the show today. Have caught up on email and Facebook and starting to feel like a little bit like myself again. And look! It’s nearly time for the Nissan event, which is at a nearby restaurant. Guess I’ll mosey along. As many times as I’ve covered the Auto Show I don’t think I’ve ever figured out the right way to do it. One nice thing about media days at the Auto Show is that there is plenty of free food and coffee. So many of the auto companies have employed baristas here that I wonder why the line at the Convention Center’s Starbucks is so long. The one problem I do have is finding a place to sit – especially in the huge press room located a story above the exhibit hall concourse. Fortunately, I discovered a Media Lounge near the entrance to the West Hall, where I was able to grab a couple of sandwiches and a comfy white leather chair. Not to mention access to wi-fi. Not too shabby. This year, I am not the only writer attending from AskPatty, so I’ve been able to narrow my coverage just to my immediate assignments (instead of trying to cover the entire show). So I’ve picked the press conferences I’m attending accordingly. I skipped Mercedes Benz so I could be seated at Volkswagen, which was promising to reveal a new version of an iconic vehicle. Since they debuted a new Beetle last year, I was hoping there might be a new VW bus in our future. But alas, when the moment came, we were treated to a new Beetle convertible. That’s not a bad thing; just disappointing because it’s not within my purview of mom cars and energy efficient vehicles. So I moved on. I skipped Fiat (too small) and Ford, because they’ve been really good about including me on all their new product launches, so I feel particularly well informed about what they are doing. 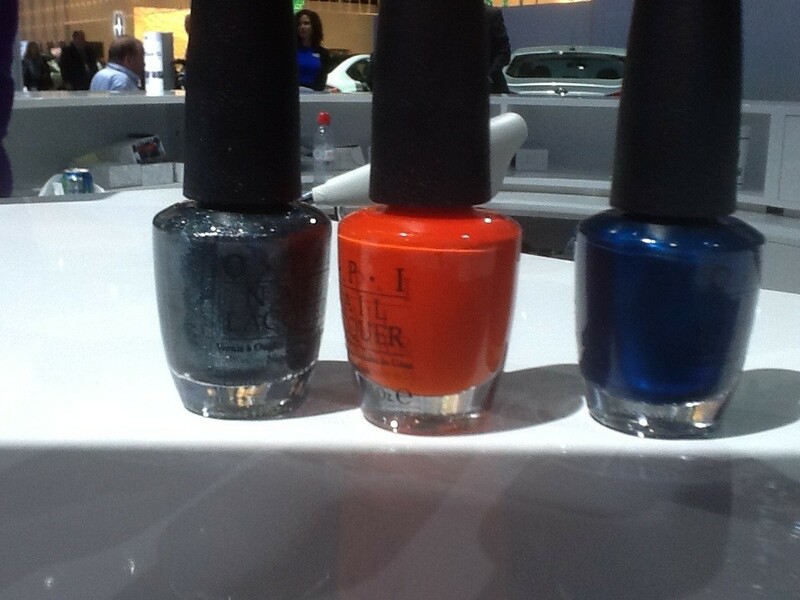 In fact, I feel I’ve been so close to them that when I visited their exhibit, I got a hug from one of their PR people… Who also showed me these lovely OPI nail polishes to match the colors of the new Fiesta debuting today. Again, that’s not a car that lines up with my assignment…so I moved along. I did not have to drive carpool today, so for the first time since I started covering this annual event, I managed to arrive at the Los Angeles Convention right at the start of the LA Auto Show. That is not to say that I got here without drama. Living the freelance life means never being able to say “no” to an income-producing assignment. And this month, I’ve had more of those than I am comfortable with. This, of course, is a good (and rare!) problem to have. But I have never been a good multi-tasker and keeping all the different jobs and tasks associated with the, straight in my head is more difficult than I expected…and I can’t shake the feeling that I’m forgetting something. Actually, yesterday, I did discover that I had made a major mistake on a job that I was counting upon to turn into something more permanent. And this morning, I discovered a myriad of small mistakes that needed to be addressed before I hit the road to the Auto Show. So I got here early…but I keep wondering if more erroneous shoes will be dropping on the other gigs while I am here pretending to be a productive member of society. Fortunately, getting here as early as I did gives me the luxury of settling into a nice seat near the front at the first automotive press conference of the day: Toyota. And so I was able to check my email, take care of some more business and hammer out this little post. I may add some fun photos and observations to this as the day progresses. In the meantime, you will be able to read my reports when they go live next month at AskPatty.com.